I’d like to say thank-you to everyone who has left a comment on our blog. It really helps keep me motivated to keep writing about our journeys. If you see a delay between writing and posting that is because the comments are moderated. Once you’ve had a few accepted then your comments become automatically approved; until then, we must manually approve them. That allows us to keep the spam comments out. You’ll likely see updates in batches rather than daily for the next while. 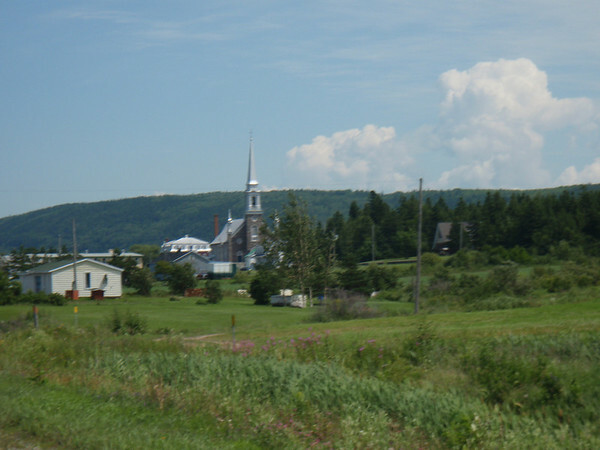 We are soon about to enter rural Quebec, Newfoundland and Labrador, and I’m not certain how often we’ll be able to get Internet. Once we make it to St. John’s, we’ll be sure to spend a few days updating the blog. 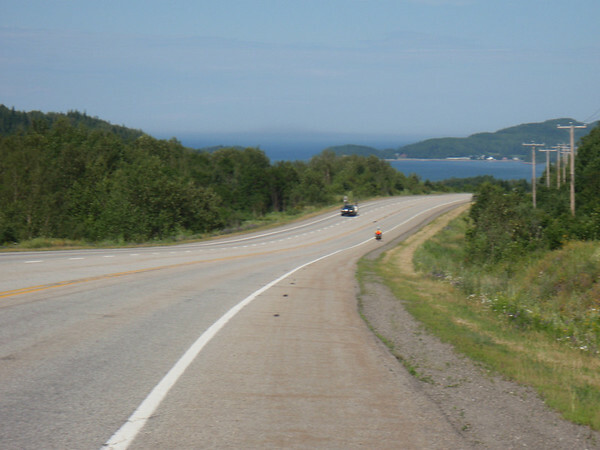 Today is our last ride day on the south shore, and it is a relatively short 60 km. We need to make it to Rimouski today so we can do a bunch of chores tomorrow before we get on the boat. Once we get on the boat we will only see small towns until we get to Lewisport or St. John’s which is at least 3 weeks away. It will be a completely different riding experience in the wilds of Labrador and Newfoundland. This morning, I awoke with the same headache that plagued me during the ride yesterday. The rash on my thighs does appear much better. I suspect that the Vitamin D supplement is the source of my issues. Last time I took it, I also got a rash, and cut all vitamins until it cleared. When we skipped the D the day before yesterday I was OK. So, I hope that is the source of the problem and both the headache and rash will go away in the next day or two. For today, a couple of Tylenol should allow me to ride without the unpleasantness of a headache. Since we don’t have a long ride, this will be a lazy morning, which we both need. Neither of us like getting up and rushing in the morning. We would rather lounge around reading or writing and slowly make our way. We each get our own space in the morning. I sit out at the picnic table drinking coffee and writing or reading. Scott lies in the tent reading or meditating. In some ways, this is an individual spiritual practice that we each need to stay sane. Since we missed it the last couple of days in the rush to get to Rimouski on time. As I type this I’m chuckling at the campers two sites down. They have a young child of 2 or 3 who is making screaming sounds to match the cackling crows. It seems the crows are playing along, so the two of them are making a gawd-awful racked! I’m just amazed at how well the child can imitate the crow. If you were still asleep before, you certainly aren’t now. 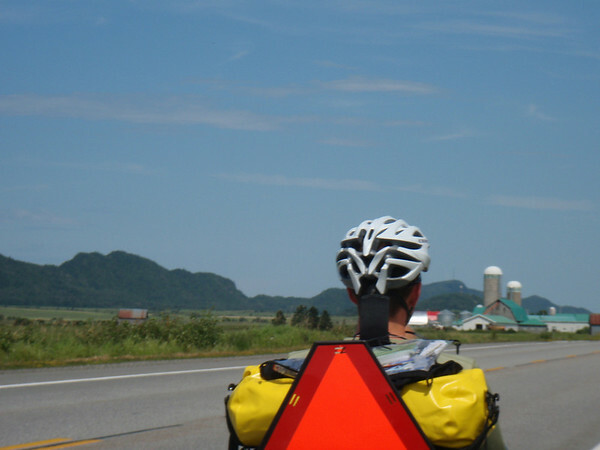 We followed the 132 to Rimouski, which wasn’t that interesting, but very quick and relatively flat. We stopped briefly after 15 km for a hotdog, which turned into over an hour break. It took them more than 45 minutes to prepare 2 hotdogs! If we had any clue how long it was going to take, we would have continued along and stopped later in the day! We at now in Rimouski and happily settled in our campsite for the night. It is nice to have Internet again, so we’ll try and get everything updated before we get on the boat Tuesday morning. Every little Quebec town on the Saint Laurence has a beautiful church. This is the one in the town with the 45 minute hot dogs! Since we didn’t take the Route Verte, we got to avoid climbing and decending these hills. 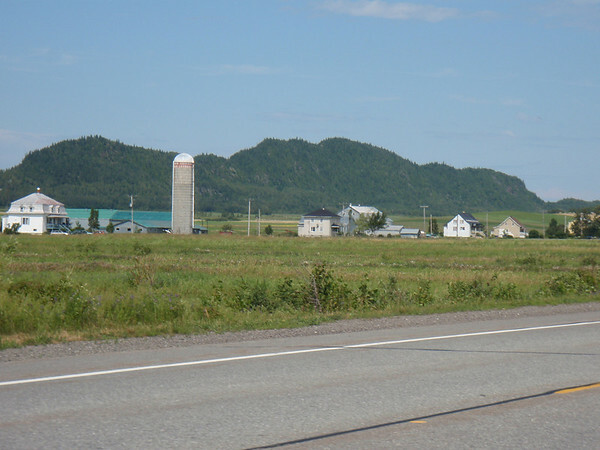 We did get to go down (and then up) some fun hills as we approached Rimouski. Enjoy reading our blog? Consider giving to Postcards for charity.